Kiosks are made up of more than just metal, computers and peripheral devices, get the most out of an Internet Kiosk with wise software decisions. Access to a secured self-service Internet connection is something most travelers expect from the hotels they choose. In fact, access to the Internet can be a consumer’s deciding factor; it can shape the customer-service experience not only at a hotel but an airline, apartment complex, healthcare facility and other service-oriented businesses. Guest Room HSIA: Free or For a Fee? 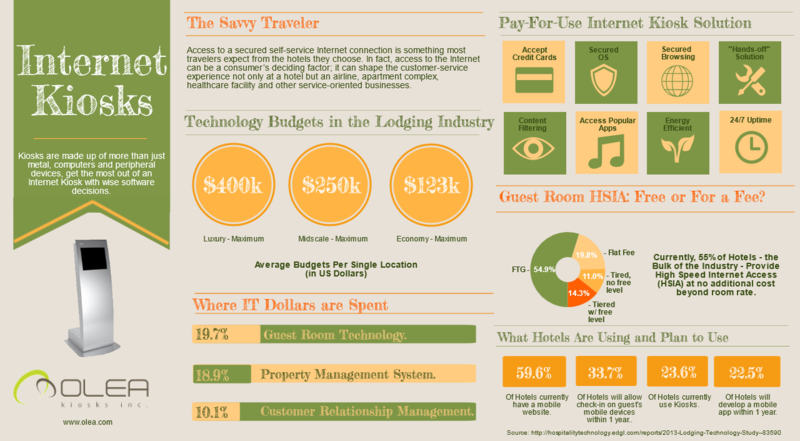 Currently, 55% of Hotels – the Bulk of the Industry – Provide High Speed Internet Access (HSIA) at no additional cost beyond room rate.